London fire caused by renovations? LONDON -- London's fire commissioner said Thursday morning that it would be a miracle if any more survivors were found after the devastating high-rise fire that killed at least 17 people. That death toll was up by five from the figure given on Wednesday, but authorities said many more victims were still expected. Fire commissioner Dany Cotton said on British television that authorities didn't expect to find anyone else alive after the blaze. The fire that began around 1 a.m. local time on Wednesday morning also injured dozens, 18 of them critically, and left an unknown number missing. The cause of the blaze is under investigation, but a tenants' group had complained for years about the risk of a fire. On Thursday morning, the first video emerged from inside the building, shot as it was engulfed in flames. Resident Rania Ibrham streamed the video live on her Facebook page at 1:38 a.m. local time. She is frantic as she tries to help people heard in the hallway find her apartment to take shelter. The Guardian newspaper said Ibrham, 30, lived in the apartment with her husband and two small children. Her husband was away on vacation, according to the newspaper. After trying to coax other residents into her home and venturing briefly into a smoke-filled hallway, Ibrham returns to her apartment and continue to stream the video, looking over the edge of her top-floor balcony. Residents of the Grenfell Tower high-rise were advised as recently as May 2016 in a newsletter that in the event of a fire they should remain in their homes and await rescue. WARNING: This video was shot inside the burning building, on the 23rd floor. Some viewers may find it disturbing. CBS News has no information on the fate of the person who shot the video. CBS News correspondent Jonathan Vigliotti reports the damage to the 24-story building is so severe that fire officials said it would take weeks to inspect each floor carefully. The cause of the fire remains unclear, reports Vigliotti, as does how it managed to spread so quickly up the apartment building. Fire experts believe, however, that cosmetic cladding -- siding added to the building's exterior in the last two years -- may be largely to blame for the scale of the devastation. Commissioner Cotton said it was too early to speculate on how the deadly blaze started. She said early Thursday that authorities had finally extinguished the last pockets of flame, and were trying to secure the edges of the building for a fingertip search. London fire investigators have been painstakingly searching for more victims of the inferno that engulfed the public housing building in London's North Kensington neighborhood. The Grenfell Tower building underwent an $11 million refurbishment in 2015-2016 that saw the new external cladding installed. It was part of a wider $73 million development of the extremely pricey Kensington neighborhood, which included the construction of new homes. Newspaper reports cited the planning documents for that neighborhood regeneration as stating that the cladding was chosen, in part, as a low-cost way to improve Grenfell Tower's external appearance to new neighbors in the expensive homes being constructed nearby. Similar external cladding has been linked to the fast spread of deadly fires on other apartment buildings both in the U.K., and as far away as Australia. According to The Guardian newspaper, the London Fire Brigade warned local municipalities across London in April that external cladding of this type could pose a risk in the event of a fire, and another report by the Reuters news agency raised questions over whether all recommended precautions to mitigate that know risk were taken at Grenfell Tower. Retuers said planning documents submitted and approved in 2012 for the refurbishment made no mention of fire barriers in the cladding to be installed between the floors of the building. The Reuters report made it clear that, while it was not necessarily a legal mandate for such barriers to be installed with the cladding, most experts say it should have been a part of the design. 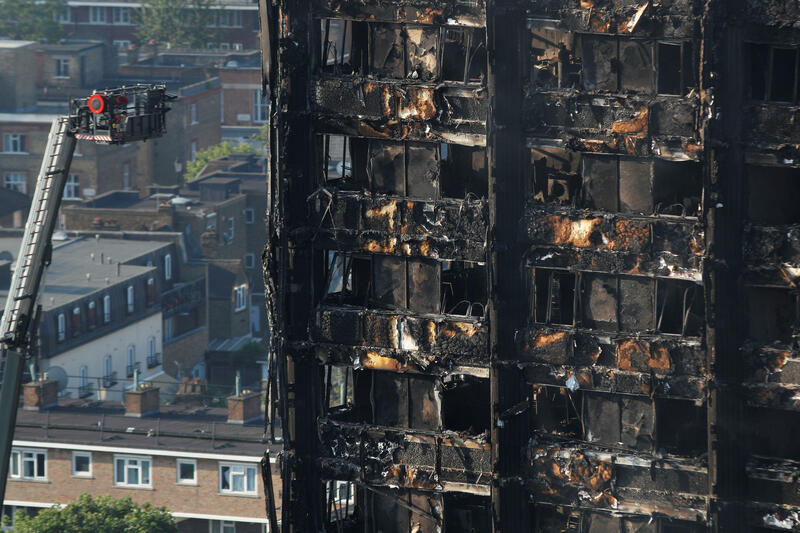 Joe Ruane, a long-time fire safety expert and inspector, told CBS News that the Grenfell Tower fire may serve as a deadly case study in how things can go wrong when not done to both legal standard, and safety specification. "Fires in high-rise towers should not behave like Grenfell Tower behaved yesterday evening," Ruane said. If the new cladding panels had been "specified correctly then installed correctly, with cavity barriers at the floor levels, the fire shouldn't have spread up the cavity (between the original wall and the new panels) like the chimney-effect" that was seen, Ruane told CBS News. Asked by Reuters, the construction company that carried out the refurbishment on Grenfell Tower "declined to say" whether the barriers between floors in the cladding had been installed. A statement issued Wednesday by Rydon Group CEO Robert Bond said the Grenfell Tower project "met all required building regulations." But as Britain's PA newswire noted, a clause that featured in an earlier statement released by Rydon, immediately after the disaster unfolded, saying the refurbishment had met all "fire regulation and health and safety standards," was not included in Bond's statement. Residents who spoke to CBS News have said they spent years complaining about fire safety concerns, including blocked exits in the building, but that the management company was never responsive. While the death toll remains unclear, the BBC reported Thursday, citing anonymous sources, that as many as 100 people may have lost their lives in the blaze.